The pickup truck market is highly competitive and requires manufacturers to continually push the envelope with new technologies and designs. In many cases, it also means pushing the envelope in terms of size. However, the 2019 Honda Ridgeline Sport for sale in Fontana, CA does things a little bit differently. It starts with a reasonable size, continues with a straightforward and handsome design, and culminates with a load of innovative features. We invite you to visit us at Rock Honda and take look at the 2019 Honda Ridgeline Sport for yourself. We have a large 2019 Honda Ridgeline Sport inventory near San Bernardino, CA and our salespeople would be honored to serve you. Of course, we’ll get you behind the wheel to test drive a 2019 Honda Ridgeline Sport near San Bernardino, CA. We’re located in Fontana, CA and have served customers from the surrounding areas near Rancho Cucamonga and San Bernardino, CA. Stop in today! One of the first things you’ll notice about the 2019 Honda Ridgeline Sport in Fontana, CA is that it is not humongous. Honda realizes not everyone needs a behemoth of a truck and most customer’s needs are met by something more sensible. 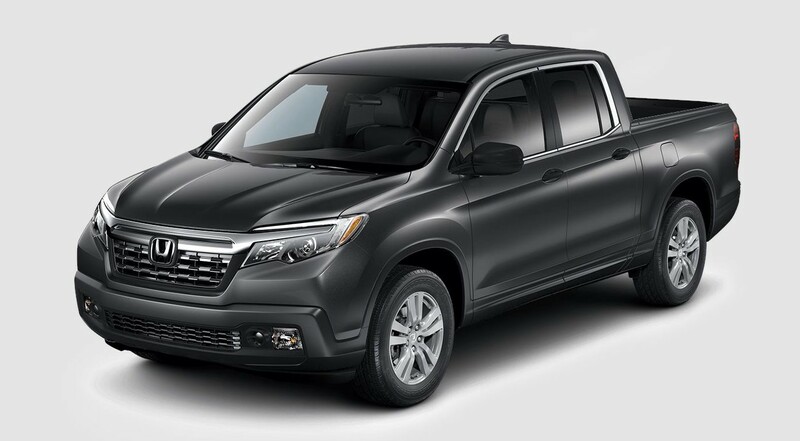 Honda then wraps the Ridgeline in a sleek and handsome design that helps the truck cut through the air more efficiently. The exterior is set off by attractive LED daytime running lights up front and LED taillights at the back. When you hop inside, your surrounded by an interior that matches the sensible design of the exterior. Seating for five people means you can take the whole crew around in the Inland Empire and the tri-zone automatic climate control will make sure everyone is comfortable. To keep the driver informed of a variety of vehicle stats, the Ridgeline comes with a multi-information display that is operated via convenient steering wheel mounted controls. If you need to store some cargo inside the cab, the 60/40 split lift-up rear seat open up a generous cargo area. In the center stack is a 5-inch color infotainment screen offering Bluetooth® streaming audio and hands-free calling plus an auxiliary input jack to play music from your device. Under the hood, you’ll find a potent 3.5-liter V6 engine that chucks out 280 horsepower and 262 lb-ft of torque. Power is routed through a six-speed automatic transmission than on to the front wheels or all four when equipped with all-wheel drive. One area Honda really innovated is the truck bed. A dual-action tailgate can either drop down or swing out depending on your needs. The Ridgeline also comes standard with the In-Bed Trunk® that provides 7.3 cubic feet of lockage storage in the bed. Ready to test drive? Visit us here at Rock Honda to drive your dream car off our lot! We look forward to assisting you on your car-buying journey.